The founder of Endurance Swimming, Craig Lewin, is a USA Swimming Coach and Level 2 USA Cycliing Coach. A graduate of Boston College and the Varsity D1 Swim Team, Craig is a Nationally Ranked triathlete. His swimming expertise has helped him become a successful competitor in the sport of triathlon and now he wants to share his experience, knowledge and swimming techniques with you. First, Athletes need to understand how to use rough waters to their advantage. Fighting water can lead to fatigue so he concentrates on making corrections to prevent exhaustion. This focus on technique combined with physically challenging workouts produces fast, efficient, successful athletes. 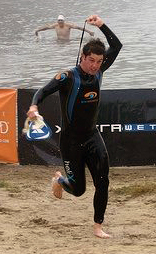 Members of the Endurance Athlete Program can expect Greater Efficiecy, Improved Efficiency, Better Stroke Mechanics, Faster Swim Times, Optimal Poser in the Water, Comfort When Swimming in the Open Water, Better Sighting Skills, Comfort with Mass Starts and Pack Swimming, along with a Razor Sharp Swimming Pace.